Between September 5 and September 9, we are hosting a naming contest for two female mantas tagged in this post. All names submitted on our manta Facebook posts will be considered. Here's more about the scientific tagging project from guest blogger Josh Stewart of the Manta Trust. The Aquarium’s Marine Conservation Action Fund helped support the satellite tagging of manta rays off the coast of Mexico, led by Josh Stewart of the Manta Trust. 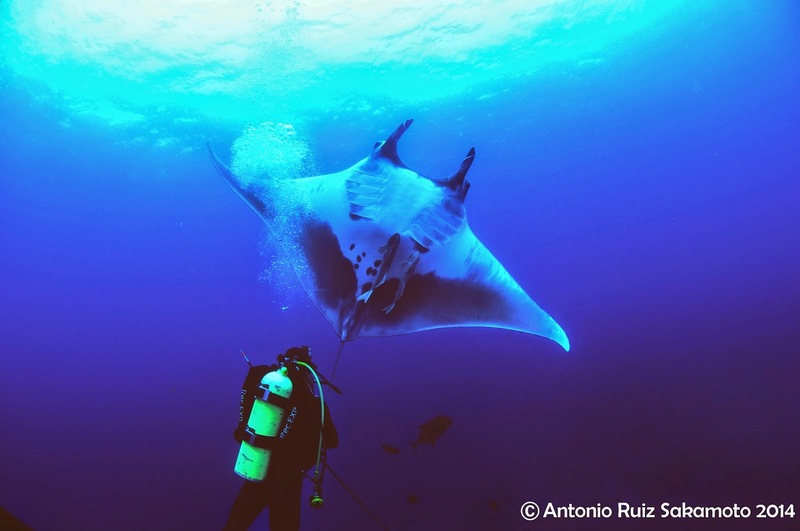 Tagging a manta is not a particularly easy task. Setting aside the technical details of the tags themselves, the days (and days and days) of travel required to reach study sites, and the hours spent in the water each day, when the mantas actually arrive, the challenge of tagging truly begins. Oceanic manta rays, our species of interest, can reach up to 7 meters in disc width, or wingspan, and weigh several tons. When you get this big, not many creatures are able to eat you. And so manta rays have effectively lost all of their active defenses (think spines or barbs in their benthic relatives, stingrays), and now rely solely on their immense size and perhaps surprising agility to keep predators at bay. As a result, mantas have few natural predators—mostly large sharks—and the only instances we know of fatal predation are when orcas have stumbled on an unlucky and apparently tasty-looking manta. Orcas aside, sharks tend to take chunks out of the pectoral fins of mantas, and always appear to attack from behind, based on bite marks and scarring patterns observed in mantas around the world. 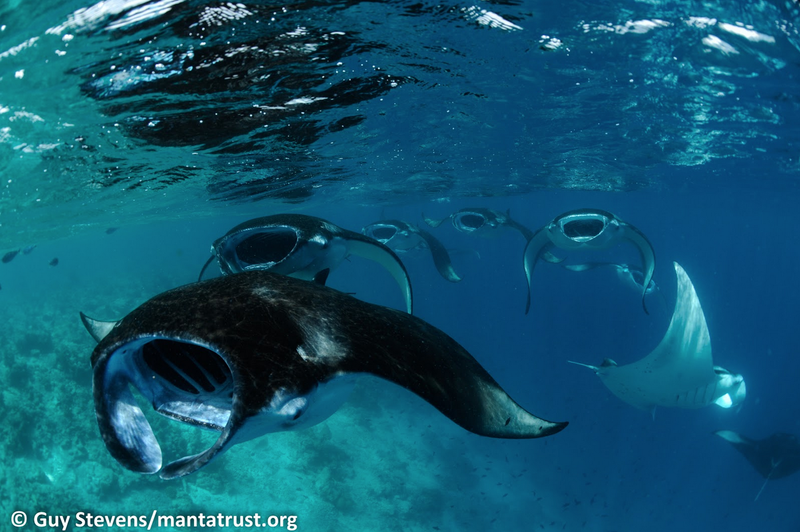 So it's safe to say that mantas sometimes get a bit nervous when something approaches them quickly from behind. Funny, then, that this is exactly where we need to be when we tag a manta. So how do we do it, without our study subject taking off at high speed the minute we approach? Patience, mainly, and gaining the trust of a two-ton giant 60 feet below the surface of the ocean. As I jump into the cool, crystal-clear blue off San Benedicto Island in the Revillagigedo Archipelago, Mexico, a watery abyss opens up beneath me. Despite 100-foot visibility, the bottom is nowhere to be seen, while the cathedral-sized pillar known as The Boiler rises from the deep to my right. The Boiler is an attraction in itself, a dramatic volcanic pinnacle alone in the blue. But the main event here is the abundance of mantas, making The Boiler perhaps the best site in the entire archipelago to see them. Five minutes after dropping in, our first manta appears: a 5-meter female with a gnarled, short tail and the scars of an oceanic giant that has been around the block a few times. She approaches the divers cautiously but with clear interest. This is one of the most fascinating aspects of being in the water with a manta: the unmistakable curiosity in their eyes, the obvious desire and willingness to interact with bubbling visitors. As she loops above their heads, coming close enough to touch and inquisitively looking each and every one of them over, a second manta appears out of the blue. This one is a black manta, the same species as the first but with almost no white markings on its entire body; the stealth bombers of the deep. Soon two more giants have joined in, and we're surrounded by curious mantas that one can't help but feel are playing with us, enjoying our company. Now comes the hard part. I pick two mantas that I want to tag: the big female that arrived first and a male that joined in later on. I make my way toward the female, who is now swimming in wide circles out into the blue and back toward The Boiler. I swim to where I think she'll intercept me, and wait for her to approach; she passes over my head and swims through my bubbles, apparently enjoying the way they must tickle her belly. She starts to swim off but I don't chase her, I let her turn back around and come to me, making tighter and tighter circles until she's passing by me every 30 seconds or so. On her fifth or sixth pass I try swimming after her slowly, positioning myself above and behind. She seems fine with it, but I stop kicking and let her make another loop. On the next pass I do the same again, this time sticking with her a little longer. She seems to be getting comfortable with me swimming behind her, but I don't push my luck. One more pass and it's time; I "load" my tagging pole, extending the thick rubber band and grabbing the top of the spear close to the tag. As she passes by me, I slowly swim behind her, but I'm still too far to apply the tag: I want the tag to be about a foot above her pectoral fin when I release it and now I'm about 4 feet away. I kick harder and pick up speed, holding my breath and hoping she doesn't spook: 3 feet… 2 feet… She's still very calm: 1 foot now… I aim my spear at the sweet spot and release, and the tag glides seamlessly into position. The manta barely flinches, and doesn't swim off despite having just been tagged. My colleague, Antonio Ruiz, a researcher and recent graduate of the University of Baja California Sur, follows and collects a tissue biopsy from her; still hardly a flinch. A few minutes later I deploy the second tag on the male in much the same fashion. I'm often asked whether the tagging process hurts the mantas. Based on the reaction this time, it seems clear that they aren't too bothered by being tagged, but in other cases mantas that I've tagged have reacted by swimming off at top speed, so it does seem to vary by individual and by region. Now while I'm not a manta and I must admit I've never personally been tagged, I can say with some confidence that mantas do not feel pain in the same way that humans do, and being tagged would not "hurt" in the same way for a manta as it would for a human. Humans have evolved complex nerve networks that serve as learning tools: the nerves in your fingers tell you not to touch a hot kettle because it will burn you, for example. Mantas haven't evolved in an environment with the same need for these 'pain' cues, and therefore they have much lower densities of nerve endings. Furthermore, while about 50% of human nerve endings are devoted to feeling pain, less than 1% of nerve endings in rays serve this purpose. The difference between tagging a manta and tagging a human is probably similar to the difference between pinching the skin on your elbow and pinching the skin on your triceps. So in cases where mantas react strongly to being tagged it's probably a result of being surprised, and in my experience this tends to happen more in regions where mantas are not as accustomed to divers. Soon after the second tag is deployed we end our dive and head back to the boat. We do three more dives at the boiler, and on each dive we see the same two mantas that were tagged in the morning. Over the course of about eight hours, until the sun begins to set and we end our day's diving, the mantas continue to follow us around, swim over our heads, look us in the eye and practically touch us with the tips of the fins, as if wanting to see what these strange, bubbly creatures feel like. We tag two more mantas—both females—before the day is through, and just before surfacing on our last dive I look down and see a train of mantas below us, almost every one of them sporting a new tag. These tags, generously supported in part by the Aquarium's Marine Conservation Action Fund, will collect data on movements and diving behavior for the next six months, at which time they'll pop off and transmit their precious, archived data back to us via satellite. 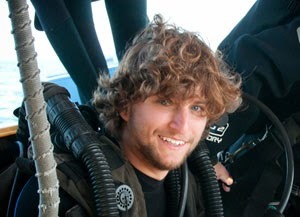 Josh Stewart is the Associate Director of the Manta Trust, a PhD student at Scripps Institution of Oceanography, and a grantee of the Aquarium’s Marine Conservation Action Fund.